I do realize how small the Marco launch is. Thats not the only west coast launch either. Do you relaize how much room we have at Crandon. What is it, a few hundred feet between lifeguard stands? We ride out and enjoy the vast ocean. How bout Matheson. We set up on a rock beach that is 2 feet from an asphalt roadway and littered with metal signs and other beach goers that stand 5 feet from the kited to watch. Also about 50 feet of beach if you call it that. Now, how bout Whale Harbour. We have about 50 feet of launch there off of a very rocky beach and again with beach goers and tourists watching 5 feet from the kite. How bout Hobie. I know I dont need to explain that one. How many miles of coast line do we have on the east coast in the Tri county area and how many feet of access do we have. Now the Miami flats are no piece of pie to ride in. You can find yourself all alone out in the big blue water in no time. Like you said. 50 square miles. And if I had to pay a taxi fee everytime I rode I would be broke. The people that screw up launch sites screw them up wether they are on their home turf or visiting other spots. How would it sound if I logged into the west coast forum and said in east winds go offshore. Stay off our beach on the east coast. Take a look at YouTube or some of the promotional sites. Theres your access issues. We make do with what we got and we share within our family. And who are the privelged few that should get to ride Marco. How many of the guys that ride Marco live on Marco Island? I'm talking about the part labeled "Launch Area." There is nothing like this in any of the areas you mentioned. This launch is unique and threatened, by us. If riders spread out along launches on the SW coast, issues would ease. In every case you mentioned, you can get away from the narrow launch area and ride as far out and laterally as you want. If people spread out there can be fewer problems. People don't seem to want to do that, although the smart ones usually try . If more people used the Flats, issues in heavily populated Miami-Dade would ease. That is assuming we didn't annoy the rangers, fingers crossed on that. Go north of West Palm Beach, crowding thins out along with frequent access issues. People pay for dive charters without a second thought, because its worth it. Same thing applies to sea taxi and kiting the flats. Last edited by RickI; 08-08-2009 at 08:03 AM. It would be great to stop east coast riders from adding to congestion and access concerns on the SW coast when good westerly winds are on. This is what you said and this is what I reacted on. The SW coast. It wasnt specific to Marco Lagoon. Noel only referred him to the Naples area. I dont think he said go straight to Marco Lagoon. Im still curious to know who the privelged ones are who get to ride the lagoon? Yes I know about and agree thee are access isues. But how do you manage that. Is there a lottery? And like I said, I bet 99% of the people that ride there do not live on Marco. So the question is, how did we seperate into east coast vs west coast. A west coast rider from Sarasota is still not on his local beach at Marco lagoon. Thats all Im saying. I think it was a poor choice of wording. And Matheson is exactly like that. Tiny lagoon. Car traffic 2 feet from you. Kids and parents wading in the water 5 feet from you launching your kite. Public park. etc. I dont ride there much but I know the regulars there do a great job of keeping it in line. And they dont post a sign that says locals only. And that is one of the most crowded spots on an east wind because everywhere else is onshore in that direction. If things go right, getting more riders out into the Miami Flats would solve a lot of problems. The more that go out there, the lower the sea taxi rates should go and the more kiters that will want to follow the crowd and go there as well. 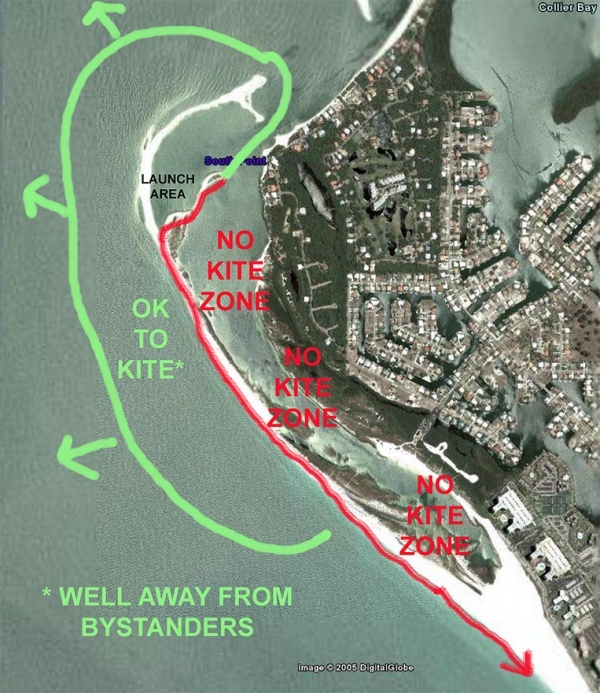 People seem to want to go where other kiters are located even if this causes problems. This should result in less crowding at Matheson and ideally help maintain access to the launches remaining in Miami-Dade. There has been 50 even up to 80 riders going to Tigertail in Marco at times. It just isn't big enough to handle that kind of loading much less guys riding further south inside the bar than allowed. Even Naples has reported problems with guys rigging up outside of normal areas. Their beach is narrow and frequently crowded with tourists. Given the density of affluent beach residents it wouldn't take too many problems to get us booted out of there. The solution is not to continue to send people to the SW coast. Build a following to better conditions right offshore and skip the 2 to 3 hour drive. That was the unspoken point of that post. It has shown up in plenty of other posts over the years however. Throwing more kiters at congested conflicted launches isn't going to solve problems. No one is going to regulate access either short of banning, unless more "Crandon-like" operations show up which isn't particularly likely or desirable unless other efforts fail. The Flats provide a unique option and right off the most populous resident and tourist area in this part of the state. We should use it. Last edited by RickI; 08-09-2009 at 12:09 PM. Your generic points on overcrowding, launches being threatened, etc. are valid. However, it is not an east coast west coast thing. Kiters from west coast slam Marco just as do east coats riders. And on an east wind, riders from west coast slam the keys and Crandon/Miami. You ever counted the kites in Matheson on a true east wind 15-20 knot Saturday? Im done. No hard feelings. Just wanted to pioint out that IMO that comment was uncalled for as it relates to turf wars. Kiting should be more effectively promoted in the Miami Flats. Matheson is way too crowded, Crandon has capacity limits, Virginia Key Beach is lost to us, Hobie is still open for now with the odd built in accident and incident, all of Miami Beach is banned, thankfully it is largely not enforced. People from around the world still vacation in Miami, some want to kite and this is what we're dealing with, for close to a decade. Tigertail, like Mead in Hollywood, the Dania Pier, Tiki Beach, Boca Raton, even Smathers have space limitations on how many kiters can realistically ride there, almost all have upwind riding requirements. Inside the bar at Tigertail is smaller than all of these. That hasn't stopped dozens of guys from crossing over to try to ride there, for years. Closing Tigertail or restricting access in Naples through careless or uninformed riding is unacceptable. Solutions are needed, not doing the same dumb stuff that keeps dragging us into City Halls all over to try to preserve access. One solution, on the surface of it, a good one is taking more folks out to the Flats. Can't have any hard feelings troubleshooter as I have no clue who you are. Thanks for your input though, catch you in another thread. In my opinion, the main thing that is uncalled for is continuing to do the same things that keep threatening to shut us down. Time to wake up and take care of what is important to all of us. Many people seem to go where they're led by others, not sure why but there it is. Let's try to lead them to the Flats. All due respect, I'm quite put off by your comments. Maybe you don't care, and maybe you are a sponsored pro, but I'm pretty sure you weren't always. I was a great wakeboarder, and I'll ultimately be a pretty good kiter, but for the moment, I'm in need of flat water to ensure I can hit Juno Kite beach with the masses safely. I've been nothing but brutalized and frustrated trying to learn in rough conditions. To that point, why don't the experienced riders like yourself go shred the surf, as opposed to areas that are flat and smooth? That way, the newer riders can learn and gain the skills and confidence necessary to not put spots at risk. I can assure you the minute I'm good enough to be confident and safe in east coast launches with rough water, I'll likely only kite at home. Your position is like an environmentalist that builds a home in a remote area, but then tells everyone else they are destroying the environment when others want to build. I want so badly to learn to master this sport, but its attitudes like yours that make me doubt what I was told when I got involved which was that it was a cooperative and helpful community. I am finding that to be true about 50% of the time, and the other is aloof, rude, impatient, or downright self consumed. Simply put, who stands to benefit most from flat water? Newer riders, but really the whole community because a rider that's learned the fundamentals in smoother water is going to be safer for everyone involved. Maybe you meant well, but not everyone has a boat, the money for taxis, or even the knowledge of how to launch off shore. Before you suggest more lessons, I'm absolutely certain I can't afford any more lessons nor do I understand how how someone can even teach you in the water unless it's in an area like the Stuart Flats, but even at that you know at the end of the day newer riders have to get out there and crash and burn many times and I know my many attempts in rough water have only frustrated me and temporarily made me doubt my commitment to learn the sport. I've been asking anyone and everyone at kite beach for 3 months and I finally found someone that was willing to share Marco with me that wasn't looking to sell me more lessons that are really only expensive water taxis to somewhere flat. I know the safe way to fly the kite, set up the kite and I've become quite proficient at self rescue due to the conditions being more than I can reasonably manage, and having been a competitive wakeboarder years back I know the board, but putting it together on the water is entirely different. When I finally reach a point where I'm as good as you must be and as good as the guy who suggested Marco to me was, I hope I'm more like him and interested in seeing more spots open because experienced riders are helping rookies come up and get better much quicker and safer and the forces behind anti-kiting movements will have far less ammunition. I'm not going anywhere. I'm learning this sport. When I reach a point I can help others, I'll be the guy volunteering to help others enjoy the sport in any way i can. I hope I always remember what it was like to be new so Im always helping others. In fact I know I will be. Welcome to kiting and that is one long first post. Flat water usually bores me to tears in fairly short order, so you can have my share. How is that? I vastly prefer waves and usually avoid flat water most of the time. I also prefer areas with few riders in the open ocean even if that means heading further offshore and to less busy spots to stay out of the way. I still like to preserve access regardless of whether it is flat or wavy however. I am less of a sponsored rider and more one of the guys that has tried to keep kiting areas open over the years. Have to say the passion is waining after ten years of fighting for it, strangely for some of the same reasons we have access problems in the first place. That is the issue with Marco, was an issue with Crandon, a managed concession since 2005 and formerly with Matheson. Matheson is now a managed concession since this post went up over a year ago. It seems to be a well run one too, looking out for rider interests. I know you are new but you do realize we have lost access to kite at many launches? The more populated and/or crowded a place is often the greater pressures on access. We just apparently lost access to one of the few west wind spots in SE mainland Florida, Hobie Beach in Miami. This was brought on by years of problem riding behaviors. Tigertail in Marco has been under threat of restrictions and bans for many years. The flat water portion is very small as you can easily see from the satellite photo. It fills up rapidly with not too many kiters. There are protected wildlife areas there that we can't afford to be seen to threaten any longer. This is the reason for the small riding area shown in the photo. If we violate it, we are violating ourselves and our privilege to ride there. If you want flat water, the Florida Keys have hundreds of square miles of just that. Much of it is thinly populated too although there are a few crowded launches that riders seem to favor despite the massive clear areas available. Winds are usually a bit stronger there too than the mainland. You should checkout Whale Harbor, Annes Beach and other areas. These sites have issues too including excess crowding at times so be sure to learn the rules. Sebastian Inlet Park also offers a west wind venue not too far from Jupiter. Stay away from the bird nesting area with your kite however, more access threats. There are few good unencumbered learning spots for new riders on mainland SE Florida, this has been the case for many years unfortunately. You are fortunate to have few problems with access in "most" but not all areas from Juno north a ways. If you head south, there are issues which you should be aware of. There is a great deal about access on this site, why not look into it? Last edited by RickI; 12-30-2010 at 08:10 PM. Here are a couple of things riders concerned about preserving the ability to ride should examine along with the rules for their riding areas. There are several for SE Florida as "stickies" at the top of this section.